Optimism is true moral courage. Sir Ernest Henry Shackleton CVO OBE (15 February 1874 – 5 January 1922) was an Anglo-Irish explorer, now chiefly remembered for his Antarctic expedition of 1914–1917 in the ship Endurance. I have been thinking much of our prospects. We had pierced the veneer of outside things. The outstanding feature of today’s march is that we have seen new land to the South never seen by human eyes before great snow clad heights [which] we did not see on our journey South on the last Expedition for we were too close to the land or rather foothills and now at the great distance we are out they can plainly be seen. Better a live donkey than a dead lion. Quoted in Moss, Stephen (28 March 2012). Captain Scott centenary: Storm rages around polar explorer's reputation. The Guardian. Difficulties are just things to overcome after all. I have been thinking much of our prospects. The appearance of Clarence Island after our long drift seems, somehow, to convey an ultimatum. The island is the last outpost of the south and our final chance of a landing-place. Beyond it lies the broad Atlantic. Our little boats may be compelled any day now to sail unsheltered over the open sea with a thousand leagues of ocean separating them from the land to the north and east. It seems vital that we shall land on Clarence Island or its neighbour, Elephant Island. The latter island has an attraction for us, although as far as I know nobody has ever landed there. Its name suggests the presence of the plump and succulent sea-elephant. We have an increasing desire in any case to get firm ground under our feet. The floe has been a good friend to us, but it is reaching the end of its journey, and it is liable at any time now to break up and fling us into the unplumbed sea. At the bottom of the fall we were able to stand again on dry land. The rope could not be recovered. We had flung down the adze from the top of the fall and also the logbook and the cooker wrapped in one of our blouses. That was all, except our wet clothes, that we brought out of the Antarctic, which we had entered a year and a half before with well-found ship, full equipment, and high hopes. That was all of tangible things; but in memories we were rich. We had pierced the veneer of outside things. We had "suffered, starved and triumphed, groveled down yet grasped at glory, grown bigger in the bigness of the whole. We had seen God in His splendours, heard the text that Nature renders." We had reached the naked soul of man. Ch 10 : Across South Georgia; in this extract, Shackleton was paraphrasing the poem "The Call of the Wild" by Robert Service, published in 1907. The difficulties of the journey lay behind us. We tried to straighten ourselves up a bit, for the thought that there might be women at the station made us painfully conscious of our uncivilized appearance. Our beards were long and our hair was matted. We were unwashed and the garments that we had worn for nearly a year without a change were tattered and stained. Three more unpleasant-looking ruffians could hardly have been imagined. Worsley produced several safety-pins from some corner of his garments and effected some temporary repairs that really emphasized his general disrepair. Down we hurried, and when quite close to the station we met two small boys ten or twelve years of age. I asked these lads where the manager's house was situated. They did not answer. They gave us one look — a comprehensive look that did not need to be repeated. Then they ran from us as fast as their legs would carry them. We reached the outskirts of the station and passed through the " digesting-house," which was dark inside. Emerging at the other end, we met an old man, who started as if he had seen the Devil himself and gave us no time to ask any question. He hurried away. 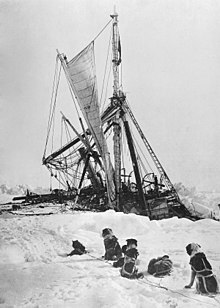 “Optimism is true moral courage,” Shackleton said, a conviction he practiced daily as he whiled away his hours, always displaying his own towering “moral courage ” in the midst of his crew. Attributed to Sir Raymond Priestly, Antarctic explorer and geologist, but appears in essence elsewhere including in Cherry-Garrard's Worst Journey in the World. "S. privately forced upon me his one breakfast biscuit, and would have given me another tonight had I allowed him. I do not suppose that anyone else in the world can thoroughly realise how much generosity and sympathy was shown by this; I DO, and BY GOD I shall never forget. Thousands of pounds would not have bought that one biscuit." Frank Wild referring to Shackleton. From his diary of the southern journey during the Nimrod expedition. 31 January 1909.